According to the findings by WHO, the global mortality rate due to cancer in 2018 surged to 9.6 million. The same study states that up to an astonishing 50% of cancer cases could have been prevented with effective and inexpensive programmes in initial diagnosis, screening, treatment, and palliative care. With the annual economic burden of cancer well-exceeding US$1.16 trillion, the demand for medical facilities to detect and control this intricate disease at the earliest is surfacing the global healthcare forum. Owing to this demand, the global cancer testing market or cancer screening market size is estimated to be $123 billion-$133 billion as of 2018 and is growing at a global CAGR of 4.5%-5.5% during the forecast period 2019-2025. Cancer testing or screening plays an important role in the detection of various types of cancer before the appearance of symptoms. The main aim of cancer testing is to reduce the number of deaths caused by cancer. Early diagnosis can lead to better treatment and a greater lifespan. Some of the cancer prevention testing-screening tests include various medical imaging tests, screening mammography, endoscopy tests, and biopsy tests. 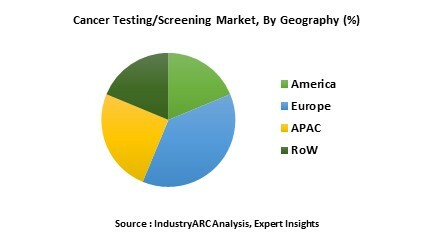 After an acute analysis of the regional market segments, the Americas is figured to be the leading region, encapsulating nearly 50%-55% of the global cancer testing market demand. The sheer affluence can be explained by the fact that alone in the United States, the number of cancer cases registered in 2018 was estimated to be 1,735,350 (1.7 million). Similarly, the Canadian Cancer Society states that about 1 in 2 Canadians will develop cancer in their lifetimes and 1 in 4 will die of the disease. Cancer screening-testing being an expensive medical procedure has found the scope of application in high-income countries only as of right now. However, government support and indigenous technologies from countries such China, India, and Japan is helping the market penetration and mass commercialization. The majority of low-income economies with inaccessible diagnosis and treatment facilities stands out as potential spots to be capitalized upon by the cancer-screening testing market players. ‘Liquid biopsy’ is one of the latest technology emerging in the market which would help in early detection of various cancers by scanning for DNA fragments which are shed by tumor cells. Companies such SRBI healthcare, GRAIL Inc., and others are raising funds for early diagnosis of cancer. In recent years, Next Generation Sequencing (NGS) is being widely used for the detection of various types of cancer. NGS allows simultaneous sequencing of targeted genomic areas in multiple samples to detect mutations. The main advantage of this method is the need of low amount of DNA or RNA. Swiss startup SOPHiA Genetics has used Artificial Intelligence (AI) that takes raw genome data and studies the molecular profile of a person’s cancer to find more personalized treatment options. This technology helps the doctors to understand the cause of cancer and what best treatment can be suggested for the molecular events that are taking place in the body. It is also predicted that AI would be the future of cancer diagnostics. Research and campaigns run by several organization regarding timely screening and cancer diagnosis are also disrupting the cancer-testing marketplace and progressing it towards broader commercialization. For example- Centers for Disease Control and Prevention campaign ‘Screen for Life’. American Cancer Society in 2017 invested $145 million in cancer research, $129 million in prevention information, and $80 million in detection. Some of the major key players operating in this technological novel and advanced healthcare landscape are Dias Orin S.P.A, Epigenetics Ag, Techlab, Genextropy Inc., M Genomics Ltd, 20/20 GeneSystems, Inc., AB SCIEX, Abbott Laboratories, Abcodia Ltd., and Abingdon Health Ltd. The base year of the study is 2018, with forecast done up to 2025. The study presents a thorough analysis of the competitive landscape, taking into account the market shares of the leading companies. It also provides information on unit shipments. These provide the key market participants with the necessary business intelligence and help them understand the future of the cancer testing/screening market. The assessment includes the forecast, an overview of the competitive structure, the market shares of the competitors, as well as the market trends, market demands, market drivers, market challenges, and product analysis. The market drivers and restraints have been assessed to fathom their impact over the forecast period. This report further identifies the key opportunities for growth while also detailing the key challenges and possible threats. The key areas of focus include the various diagnosis in cancer testing/screening market and their specific advantages. 1. Is the market for cancer testing/screening growing? How long will it continue to grow and at what rate? 2. Which type of systems presents the major growth opportunities? 3. Is there a possibility for change in the market structure over time? 4. Are additional developments needed for the existing product or services offerings or do the existing products meet the customer demands? 5. Do the key vendors look for partnerships to expand their businesses with respect to geography or product? 6. What are the short-term, long-term, and medium-term growth drivers for the market? 7. What are the short-term, medium-term, and long-term challenges for the market? 9.	Who are the top players/companies of the market? 10. What are the recent innovations in the market? 11. How many patents have been filed by the leading players? 12. What are the types of patents filed by the leading players? 13. What is our Vision 2030 for cancer testing/screening market? Analyze the competitive factors, competitors’ market shares, product capabilities, and supply chain structures.